Select the "Screen Saver" tab. 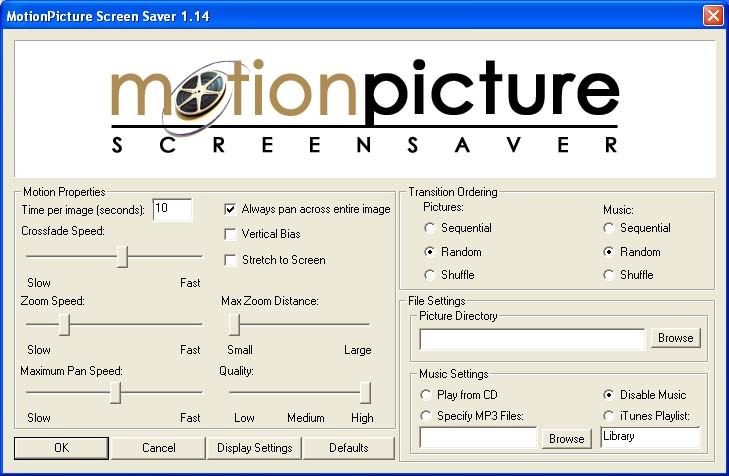 Select the MotionPicture screen saver and click "Settings". If you are using multiple monitors, select "Display Settings" and enable each monitor you would like to use. Specify the Motion Properties, Transition Ordering, and File Settings. Time per image specifies how long each image will be displayed. Crossfade speed specifies the amount of time spent transitioning between images. The Zoom Speed slider controls the speed of the zoom motion for each picture. Note that adjusting the time per image will also affect the zoom speed. The Max Zoom Distance slider controls the maximum amount that the screen saver will zoom in on a picture. Setting this slider to "Small" will ensure that the largest possible amount of the picture will be displayed. If parts of the image are still not visible on the "Small" setting, then the image has an aspect ratio that does not match the current resolution, and therefore can't show the whole image. If this is a problem, select the "Always pan across entire image" setting or select the "Stretch to Screen" setting. The Maximum Pan Speed slider controls the maximum possible speed used for panning an image. The actual pan speed for each image is randomly selected between no panning and the maximum pan speed. This slider will do nothing if the "Always pan across entire image" is selected. Note that adjusting the time per image will also affect the pan speed. The "Always pan across entire image" checkbox forces the screen saver to always pan across the entire image to ensure that most of the image is displayed. This works well if important regions of the image are not being displayed or if panoramic images are being used. The quality slider can be lowered to shrink large images, in order to improve performance or reduce memory usage. Vertical Bias can be used to force the screen saver to always show the upper half of images. This feature works well when displaying images of people whose faces are generally on the top of the picture. If you are using the "Always pan across entire image" setting, this settings does nothing. Stretch to Screen stretches each image so that it will fit perfectly on the screen. This settings is not recommend because it can make certain images look strange. Random selects images and music randomly. Picture directory is the base directory that contains jpeg images to be displayed. The screen saver will find all jpegs stored in this directory and any subdirectories (so DO NOT select c:\ unless you want to wait a while for the program to search your entire hard drive for images). Specify the music settings that you prefer. You can either read directly off a CD, specify a location of MP3 files, or specify an iTunes playlist. Note that iTunes is a seperate program and must be installed to use this feature. iTunes can be downloaded from www.apple.com/itunes. Make sure that when you specify an iTunes playlist, the name matches the playlist on the left side of the screen in iTunes. The entire library can be played by specifying the playlist "Library". Currently, iTunes must be started manually before using the screensaver. Hopefully, I will fix this problem in future versions. Test the screen saver with either the "Preview" button, or click "ok" and wait for the screen saver to start.